University of New Brunswick marine biology researcher Thierry Chopin was an invited panelist at the eighth edition of the Monaco Blue Initiative held recently in Monaco. The Monaco Blue Initiative was launched in 2010 by His Serene Highness Prince Albert II of Monaco, and is co-organized by the Prince Albert II of Monaco Foundation and the Oceanographic Institute, Foundation Albert I, Prince of Monaco. Its members meet annually to discuss current, and anticipate future, global challenges of ocean management and conservation. This event is an effective platform for fostering dialogue and networking between representatives from various backgrounds (scientists, economic players, policy influencers and political decision-makers) in order to improve the relationship between humanity and the ocean. It aims to analyze and highlight the possible synergies between preserving the functioning of marine ecosystems and socio-economic development. This unique type of gathering is essential in the quest to find sustainable and interdisciplinary, long-term solutions to complex issues. This year, finding a balanced approach to the management of activities and the development of marine protected areas was the core of the discussions among the 127 participants. Dr. Chopin was one of four panelists of the session “Aquaculture and Marine Protected Areas,” which explored whether these two activities can be compatible and the conditions under which a well-regulated activity and a preserved space for nature can co-exist and complement each other. Due to popular demand, at the opening reception the night before, Dr. Chopin repeated his IMTA dance (a variation on YMCA by Village People! ), which he had performed last year at the seventh edition in São Paulo, Brazil. Dr. Chopin was invited to discuss the role that integrated multi-trophic aquaculture can play in, alongside, or near marine protected areas. During his presentation, Dr. Chopin argued that there is convergence between integrated multi-trophic aquaculture and marine protected areas for management synergies and effective governance. The highly flexible nature of the integrated multi-trophic aquaculture concept means that the appropriate and complementary species can be selected at the appropriate scale to suit the particular marine protected area and its proper management. He argued that to bestow full value to integrated multi-trophic aquaculture, extractive species, such as seaweeds and invertebrates, need to be valued for not only their biomass and food trading values, but also for the ecosystem services they provide – including nutrient biomitigation, irrigation-less and deforestation-less food production, oxygen provision, habitat restoration, carbon sequestration, coastal acidification reduction. He noted that ecosystem services should be used as financial and regulatory incentive tools – for example, through the development of nutrient trading credits. The integrated multi-trophic aquaculture multi-crop (growing fish, seaweeds and invertebrates) approach is a diversification strategy to reduce economic risks, while also addressing pending climate change impacts. Just like in agriculture or on the stock exchange, diversifying your portfolio is always a good strategy. “Integrated multi-trophic aquaculture can provide jobs for local communities in or near marine protected areas, which often spur concern about displacing jobs in traditional seafaring industries. Integrated multi-trophic aquaculture can create jobs in such areas in sustainable development related activities (for example, local eco-tourism, seafood production and restaurants),” Dr. Chopin says. “It can also provide local food and nutrition security, alleviate poverty, and contribute to the socio-economic resilience of local communities. Eco-tourism could significantly help the aquaculture sector gain societal trust and licence to operate,” he says. He says that integrated multi-trophic aquaculture development is hindered in several countries, including Canada, by obsolete policies and regulations; and marine protected areas are not always easy to establish. But Dr. Chopin says teaming up would help validate their convergent approach through a number of concrete case studies. He is involved in two projects, in Brazil and in France, where the possibilities of joint integrated multi-trophic aquaculture and marine protected area development are being studied. He notes this could have applications in Canada. The conservation targets of protecting five per cent of Canada’s marine and coastal areas by 2017, and ten per cent by 2020, have been announced, while today only about one per cent is protected. 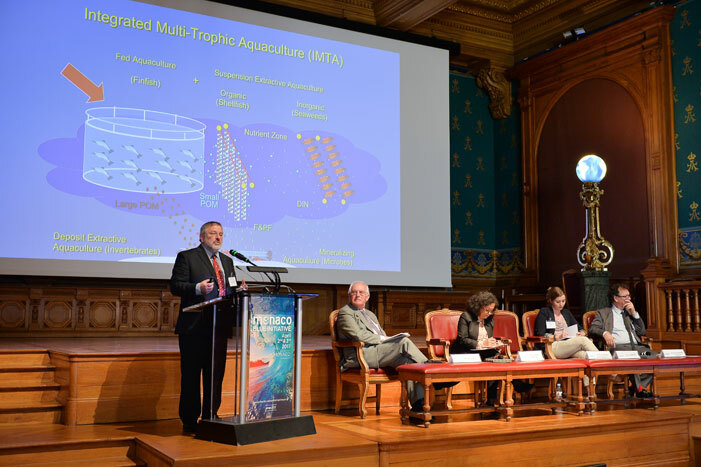 Photo: Dr. Thierry Chopin gives his presentation on the compatibility of integrated multi-trophic aquaculture with marine protected areas at the eighth Monaco Blue Initiative in Monaco (photo credit: ©Michael Alesi - Monaco Blue Initiative).